In Arizona, Rep. Gabrielle Giffords Having 'Major Effect' On Senate Race : The Two-Way Other Democrats are hesitating about getting into the campaign for the seat now held by outgoing Republican Sen. Jon Kyl. They first want to know if Giffords, who is recovering from being shot, will be a candidate. While Rep. Giffords recovers, her staff has continued to work. 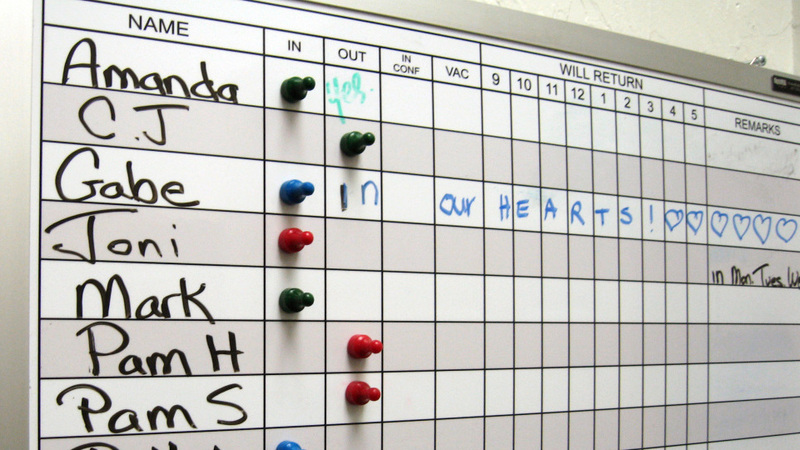 As this file photo of the office's in/out board shows, though, they do so knowing that one aide — Gabe Zimmerman — was killed in the Jan. 8 rampage. As she continues to recover from the injuries she received in a Jan. 8 shooting rampage that left six people dead and another 13 with gunshot wounds, Democratic Rep. Gabrielle Giffords is "having a major effect on Arizona politics," The New York Times writes today. That's because other Democrats are hesitating before getting into the race for the Senate seat now held by Republican Jon Kyl, who's not going to seek re-election next year. They first want to see if Giffords recovers enough to mount her own campaign for that seat. "A Democrat running against her would be doomed" one unnamed "prospective Democratic candidate" tells the Times. It's worth noting that our colleague Ken Rudin, over at It's All Politics, has suggested there's no need to "rush Gabby Giffords into [the] 2012 Senate race."